New York platinum continued its free fall Thursday while gold stopped bleeding to close just slightly lower. Crude-oil gained $1.05 to end at $125.49 a barrel, but a firm US dollar kept gold in check. Car demand fear was cited for platinum’s loss, as the metal is used in catalytic converters. The metal is near a six month low. Silver dropped 16 cents to $17.30 an ounce. Platinum continued its losing streak, falling sharply to $1,713.80 an ounce for a daily drop of $47. Gold lost just 50 cents, closing to $922.50. "Gold remains on the defensive, following the shift in sentiment after the start of this week" said senior analyst Jon Nadler at Kitco Bullion Dealers. "The $915 area remains a support zone that must hold, lest the metal next tries to find buyers under $900 per ounce." A falling greenback makes commodities like silver, gold and platinum, cheaper for overseas investors. 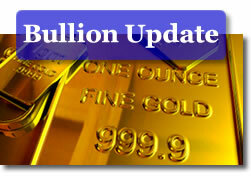 Bullion spots are available on the CoinNews page, Silver, Gold & Platinum Spots.